Add some excitement to your Armchair Travel activity. Providing a passport to every participant will give them a visual reminder of the many places they have traveled without ever leaving their chair. 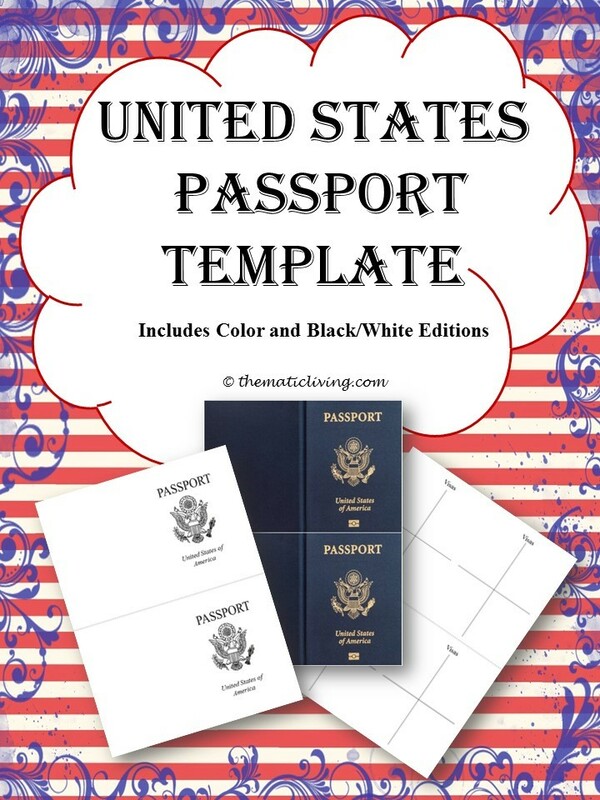 There are two different versions of the United States Passport Template: Full Color and Black/White. Using the color edition will make your activity more realistic, because it closely resembles an actual United States Passport. However, if you prefer black and white to color or would like to save on colored ink then using the black and white edition may work best for you. Another option is to print the black and white edition on colored paper or card stock, this makes the passport personalized to the color you would like or have available. You could also use a combination of the color and black/white editions together. I would recommend printing the passport cover and picture page, front-to-back, on card stock for the cover of the passport. Then photocopy two identical visa pages, front-to-back, on standard paper. Cut along the horizontal line of all the sheets. Then fold in half and staple the passport together. Be sure to test print 1-2 sheets to make sure the margins line up for your printer before printing in large numbers.